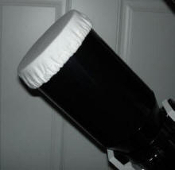 While these covers are not a great leap forward in the technology of capturing flats for CCD imaging, however, having struggled with a T-shirt to get it to stay on the OTA, we know how much easier this method is. These covers are fully machine washable. They are constructed with two layers of heavy weight cotton, with the weave 90 degrees offset from each other. Copyright © 2007-2019 AstroGizmos. All rights reserved.